Enterprise Asset Management (EAM) is a familiar term in the maintenance and reliability community. But the real meaning of EAM often gets lost in a jumble of competing EAM software systems. Although IT systems are a key element of EAM, the defining feature of EAM is not technology. It’s philosophy. EAM is an approach for maximizing value in asset-intensive operations. It orchestrates the operation to achieve success. If your organization wants to improve asset management, you need to understand what EAM is and how to implement it. What is enterprise asset management? EAM is a strategy for managing physical assets that coordinates the enterprise to maximize the total value that assets deliver over their life cycle. That definition is short, but it’s complicated. Let’s unpack some of the ideas. Physical assets may include production equipment, buildings, trains, pipelines, public land, or any other tangible property. Although the types of assets differ, they all have three things in common. They represent a capital investment; they are important for service delivery; and they must be maintained. Enterprise refers to the whole organization. It spans all business locations (such as manufacturing plants and MRO storerooms), business functions (such as procurement, maintenance, and accounting), and IT systems (including EAM, CMMS, SCADA, IOT, GIS, and ERP). Value is something that each organization must define for itself, but it is usually some combination of performance, cost, and risk. Manufacturing plants, for example, want to maximize equipment uptime while keeping maintenance costs and safety incidents to a minimum. From those definitions, you can see that enterprise asset management is a strategic and holistic approach to physical asset management. It brings together the whole organization – business sites, departments, and IT systems – to optimize performance, cost, and risk associated with physical assets throughout their life span. What does EAM really mean? That last paragraph is a good working definition of EAM. But you can’t implement a definition. If you want to translate the terminology into concrete actions, you need to know what it really means: the basic principle on which the strategy operates. The basic principle of EAM is synergy through standardization. Synergy is the creation of a whole that is greater than the sum of its parts. In mathematical terms, it’s when 2 + 2 = 5. Enterprise asset management creates value by coordinating asset management to produce synergy. That’s the biggest difference between typical maintenance strategies (such as preventive maintenance) and EAM. While maintenance focuses simply on the upkeep of assets, EAM focuses on creating organizational synergy by coordinating business functions and IT systems. Enterprise asset management creates synergy by coordinating and standardizing how physical assets are managed. Standardization is what creates synergy. To produce a coordinated effort, you must standardize how you manage physical assets across the organization. This includes business processes, data, and IT systems. There’s no reason one plant should manage equipment differently than another, or one storeroom should manage spare parts differently than another. It’s the same thing that happens when an orchestra plays together. Everyone reads from the same sheet music, and everyone follows the conductor. That’s standardization. The result is a harmonious, coordinated symphony that’s far more than the simple sum of each instrument’s part. That’s synergy. EAM works the same way. When you coordinate the asset management operation, it results in a collaborative effort that produces more value collectively than the separate components could working alone. That’s synergy through standardization. A framework of documented standards, as outlined above, is what ISO 55000 calls an asset management system. It is the industry-accepted method for implementing EAM. Asset management systems provide a structured, documented model for managing assets across the enterprise. They are a best practice recommended by multiple international standards, including ISO 55000, PAS 55, and ISO 41000. If you want to establish an asset management system and implement EAM, you don’t have to start from scratch. SynergyTM Asset Management System is SwainSmith’s ISO-compliant solution for implementing EAM quickly and easily. It provides a framework of documented standards for the whole asset management operation, including maintenance management, MRO management, and indirect procurement. What about EAM software systems? This leads to an obvious question. If EAM is primarily about strategy and standardization, where do EAM software systems fit into the equation? EAM software and other IT systems are essential tools for EAM. You could implement EAM without any IT systems, but the result would not be efficient or competitive in today’s technology-driven industries. Your organization should have a single EAM software system for storing information, managing work, and analyzing trends related to asset management. You should also integrate the EAM software system with other IT systems, such as IIoT, SCADA, GIS, and ERP. This allows you to take advantage of synergy with your IT systems. For example, IIoT can monitor asset conditions in real time and send the data back to the EAM software system, which can use that information to track asset performance or automatically generate work orders. The two technologies are more valuable together than they are individually. That’s the spirit of EAM in a nutshell. 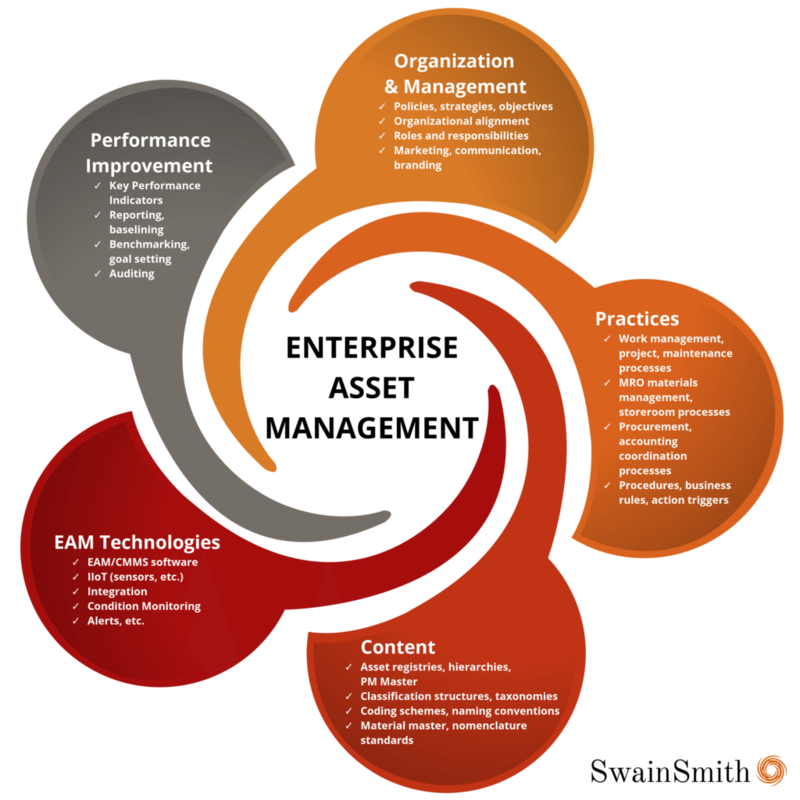 What are the benefits of EAM? EAM formalizes the asset management effort. It takes disconnected and directionless operations and turns them into a structured and disciplined program. It enhances strategic planning capabilities and the ability to deliver on objectives. It improves asset performance in terms of equipment availability, asset longevity, and other key performance measures. It increases ROI from EAM software systems by improving ease of use, data integrity, and reporting capabilities. It reduces costs by creating synergy and eliminating waste, without sacrificing asset reliability or service levels. It demonstrates responsible management of assets to customers, owners, employees, regulators, insurance providers, and other stakeholders. Explaining the concepts takes time. But in practice, EAM is simple. It starts with standardization of practices, data, and software. It ends with the creation of synergy, which enables you to get the maximum return on investment from your physical assets. When you strip away the fancy terminology and technology, that’s what EAM really means. What will you achieve with EAM? Enterprise asset management gives organizations a strategic way to increase uptime, improve performance, and reduce costs. Is your organization ready to take the next step with its assets? Call 828-215-9471 or email us to get started today. Tracy S. Smith has been helping organizations solve their asset management challenges for 20 years. He is the president of SwainSmith, Inc., an EAM solutions company. He also offers complimentary 30-minute EAM consultations. No sales pitch or a pesky follow-up call. Just straight answers to your questions—and an objective, experienced assessment of your issues and goals.